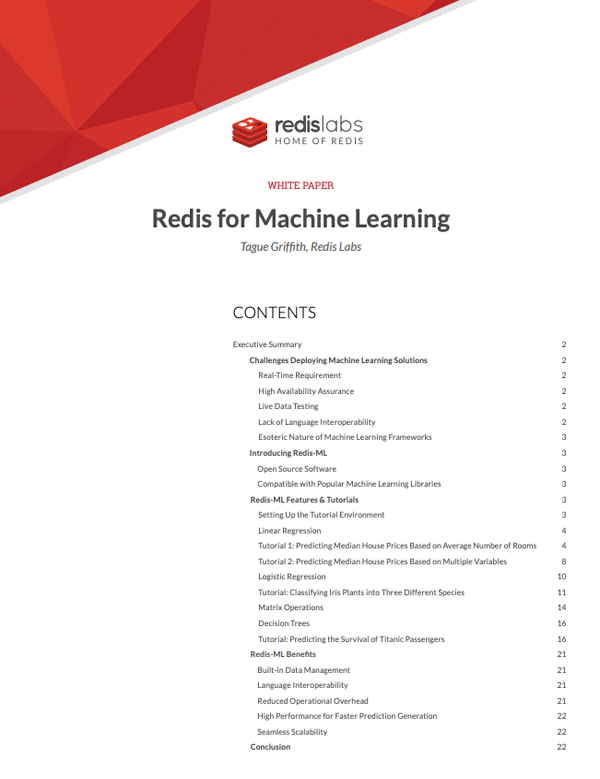 This whitepaper from Redis Labs provides a handy guide to implementing common machine learning models such as decision trees, matrix operations, logistic and linear regression in Redis-ML, a breakthrough Redis module. While a majority of machine learning toolkits focus primarily on training models, deploying custom machine learning solutions requires solutions to its own set of challenges. Redis-ML is a Redis module that implements several machine learning models as built-in Redis data types and makes it simple to load and deploy trained models from any platform (such as Apache Spark and scikit-learn) in a production environment. Download this whitepaper and learn how to implement machine learning models in production, with simple APIs and without having to implement custom code or set up a highly available and scalable infrastructure to support the activity. Developers can build their predictive engines within the familiar, full-featured, and highly performant Redis data store, and the advantages built-in data management, easy scaling and language interoperability at low operational overhead and high performance.